I’ve been baking no-knead bread on and off for quite a while as you know. I love the smell of bread being baked in the oven but before that, the smell of yeast. I’ve been inspired by the book I’ve started to read, called “The Storyteller” by Jodi Picoult, which is full of stories about baking bread. I totally agree, as it’s said in the book, that bakers and butchers should always be regarded as high professions. They have my full respect for sure and I am one of many wannabe bakers who try to master the magic of how yeast turns flour into bread: and of how yeast turns into wine: and of how yeast turns milk into cheese. In the book, the main character, Sage, anthropomorohise bread by describing how she needs to sit quietly and retreat from touch and noise in order to evolve. I sometimes feel like that, too. 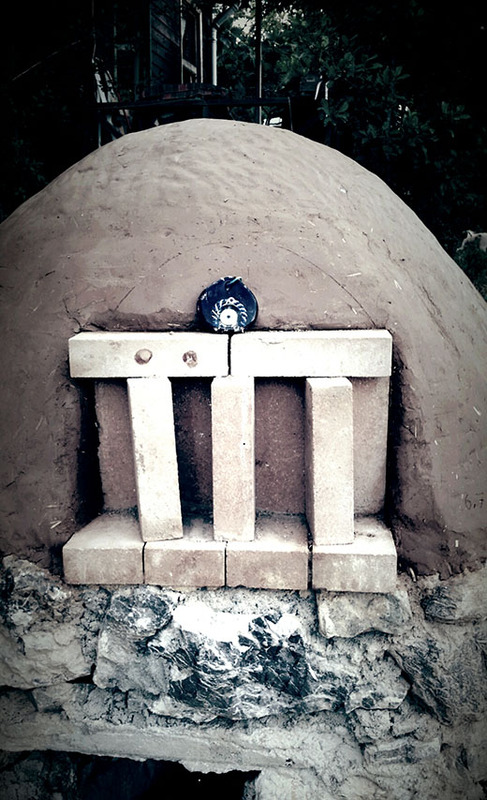 A new stone oven is waiting for the final stage and will be ready for the first batch of baking in a few days, and my dough will be the first sacrifice to see whether or not the oven works. I can’t wait to graduate from baking bread in my tiny oven, which makes me break out in sweat in the fear of getting my hands burnt as it has very little space for maneuvering the dough. I still haven’t got around to buying a Dutch oven, therefore I’ve been baking in a very primitive way, but I’ve been quite satisfied with the results. 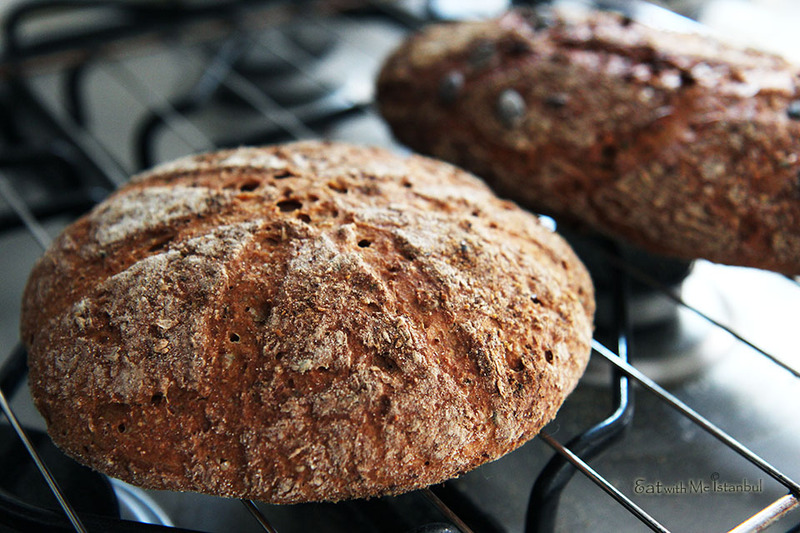 I had many chances to bake bread with a real Dutch oven while spending time in France and I got the hang of the difference each variation makes. I experimented with different flours and different combinations and ratios. The one I was most impressed with was spelt bread. Spelt flour was so easy to find there but I haven’t come across it here yet. 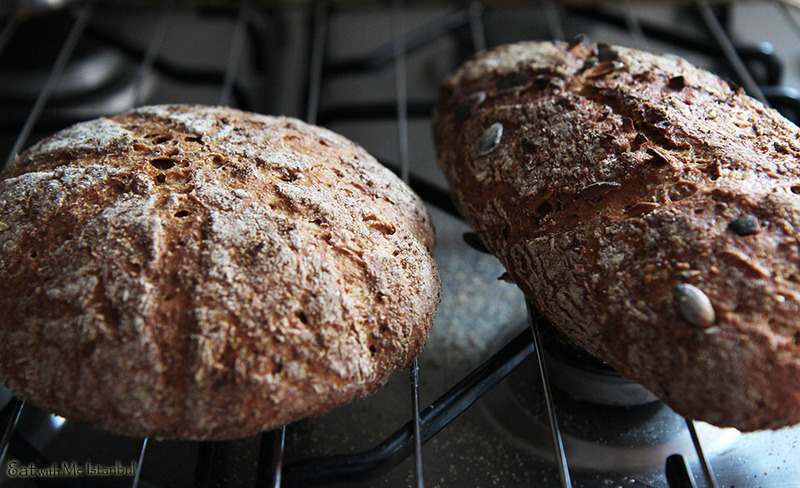 I also baked with all kinds of grains and seeds as well as a sweet bread with apple, which I thought was great for breakfast as well as a coffee snack. Back home, into my minimalist and nomad kitchen, I tried to relive my memories by baking one. It’s good to do it every now and again to keep the baking skills from going rusty; repetition makes perfection in deed. Let’s see what I’ve got for bread. Rye flour and mashed pumpkin- mind you, the pumpkin puree was freshly made, not canned. I first stir 2 cups rye flour plus 1 cup whole wheat flour and sea salt and yeast in a big bowl and mix with water. 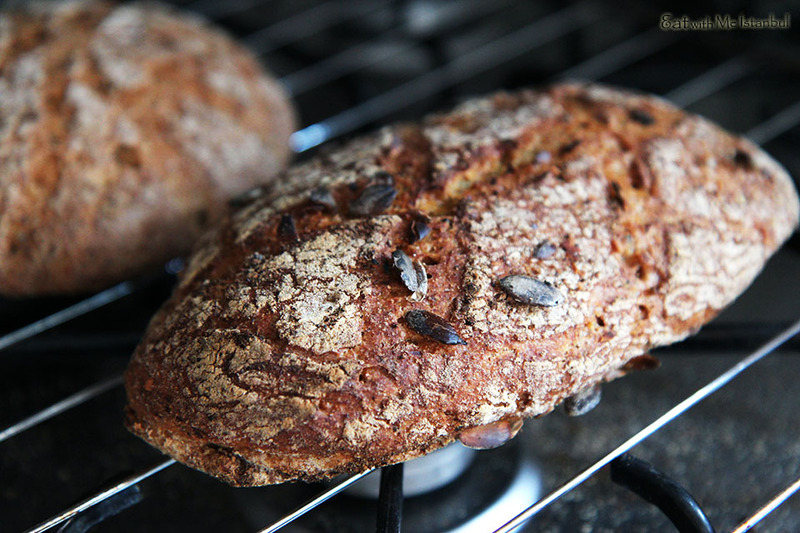 Then, I sprinkle some rye flour on top, cover it with a plastic bag and let it ferment – usually inside the oven – for 10-12 hrs. As it’s summer, the process is faster and I don’t have to worry about keeping it at the right temperature, which is excellent. Then, I add the pumpkin puree, maple syrup and a dose of aromatic and medicinal spices and ferment the dough for another 6-8 hours. As you can see, the dough has doubled significantly, which always gives me such a joy. 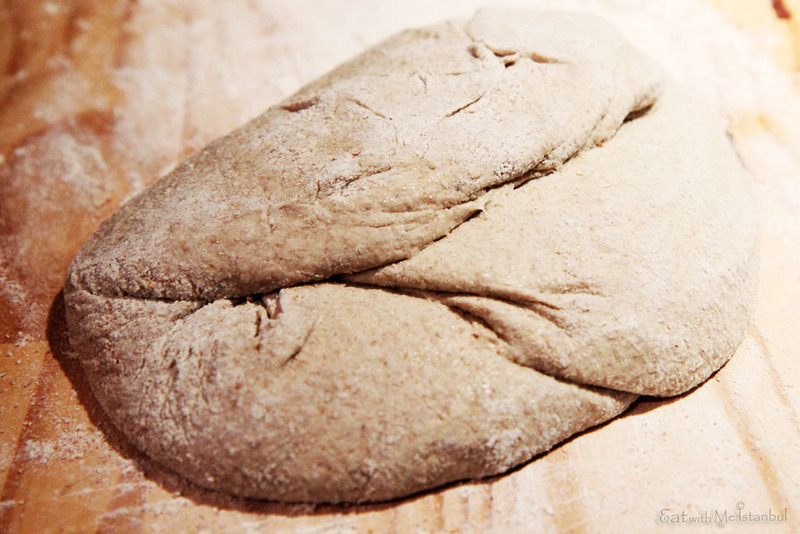 Now you gently scrape the dough onto the floured work board and quickly fold, fold and fold – three sides – and flip it on to a kitchen towel dusted with semolina or bran or whatever you fancy. Let the dough sit for another 40-60 mins until it rises almost in double. Halfway through the second rising, I turn on the oven with a cast iron grill upside down in one oven and a tart dish in another oven, and broiler pans at the bottom of the oven. Oh, I almost forgot to mention. I made two small loaves so that I could take to Mr.O’s parents’, so I divided the dough into two before the second rising. I wish I’d had more sunflower seeds but I only had a half tablespoonful and sprinkled them over one loaf, which I kept since it was deformed. The result was satisfactory and I enjoyed it alternating both savoury and sweet flavours with goat cheese or jam but it was actually so good simply with olive oil than butter. I can’t wait to bake my next batch in the real stone oven. Let’s hope it won’t break. 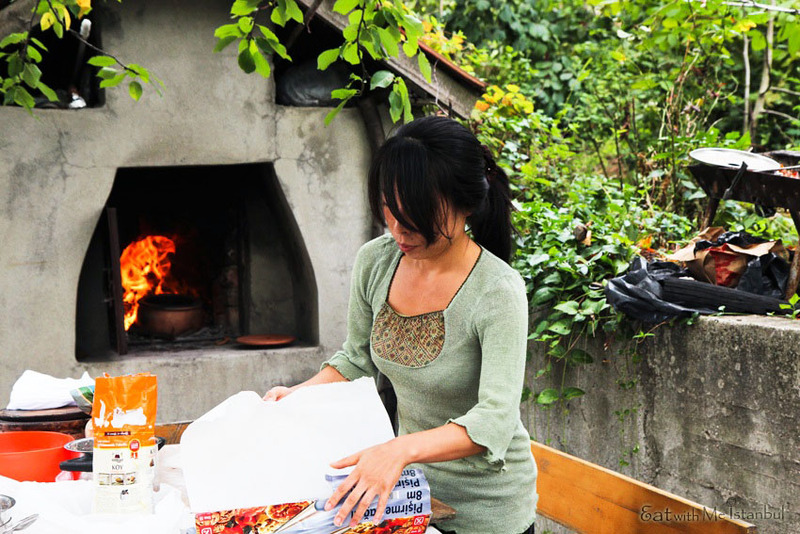 The oven was built by Mr.O’s aunt following the instructions found on the internet and with a help from her neighbours. City people aren’t really expert at this kind of stuff and her last attempt failed. But I still have a backup stone oven at Mr.O’s parents’. One of the best memories of living in the old world is being able to learn how to live with basics, and I feel blessed. If you throw away leftover bread, please think again. It is a holy process and we all should treasure all kinds of bread. 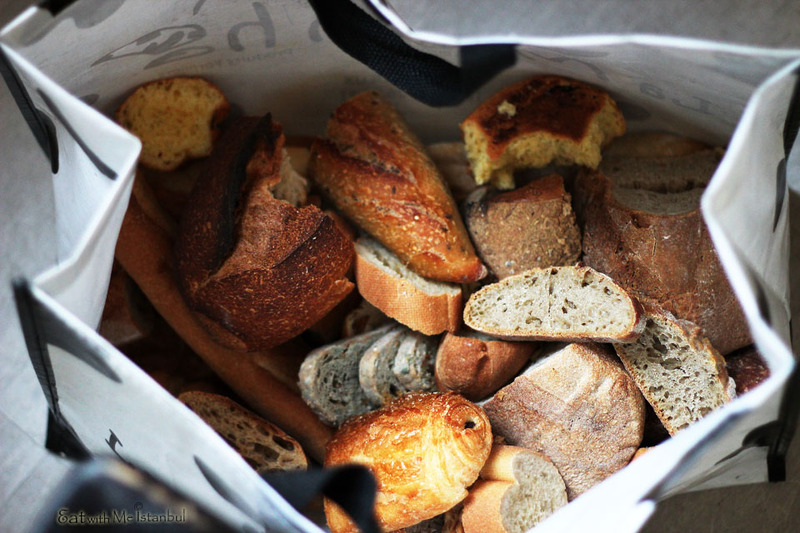 I just remembered to look for the photo of the impressive bread bag with all sorts of bread, some even moldy, at my friend’s place in Lyon. I am sure she digs through this bag looking for fine bread pieces to use for pain perdu. That’s why I like bread pudding, too. What amazes me is the sourdough bread, good bread, never goes moldy. Once you experience that, you will open up to the greatness of sourdough bread. I have some leftover bread drying out in the pantry and I’ll find an excuse to use it up one day, all despite the nagging Mr., who keeps threatening me to throw the old bread away and who still gets embarrassed when I ask for a doggy bag at restaurants. 🙂 He will probably run out and never return.